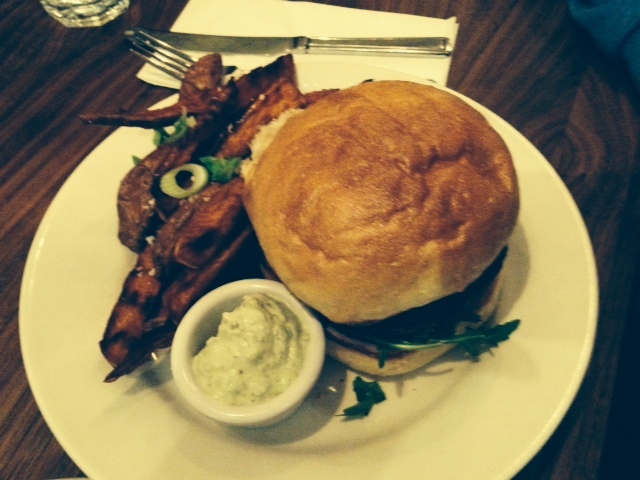 vegan restaurant | Are there chicken sheds in heaven? 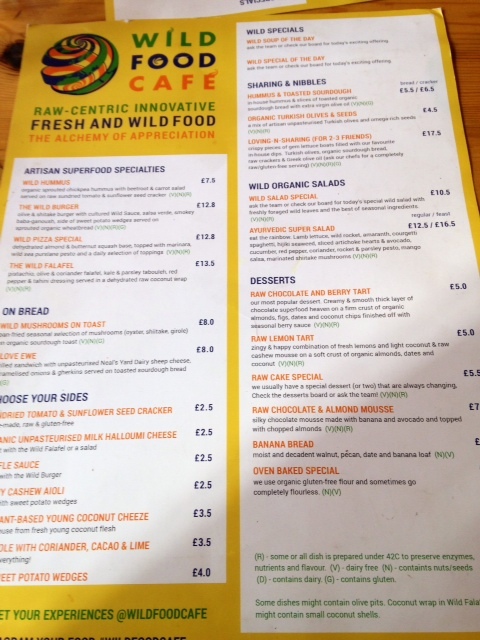 I finally made it to the Wild Food Café in Covent Garden today. I’ve been meaning to go for months and months and it was well worth the wait. 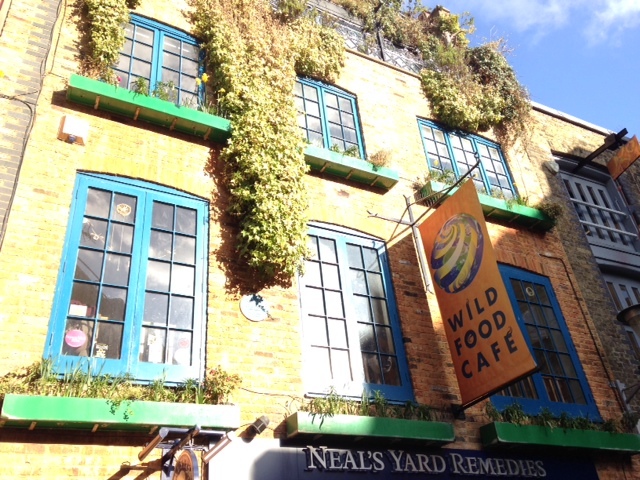 It’s tucked away above Neal’s Yard. It’s cosy (seats about 40 people) but bright and airy. It’s a really lovely space with the kitchen in full view bang in the middle and you can either sit at the bar that runs all around the kitchen and watch them cooking or at one of the 4 big tables overlooking Neal’s Yard. Today it was absolutely freezing outside but the sun was pouring in through the large bay windows and it felt like a little haven of friendly, cosy, welcoming, warmth on an Arctic London day. 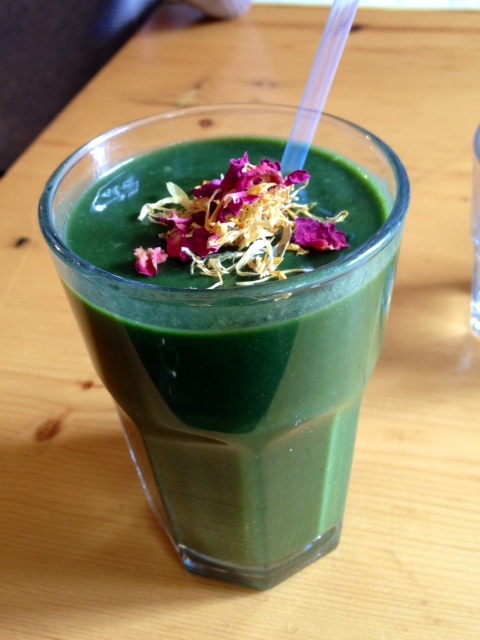 It describes itself as a ‘raw-centric food restaurant’ and uses ‘wild, fresh, colourful gourmet ingredients & plant-based (vegan and vegetarian) cuisine’. 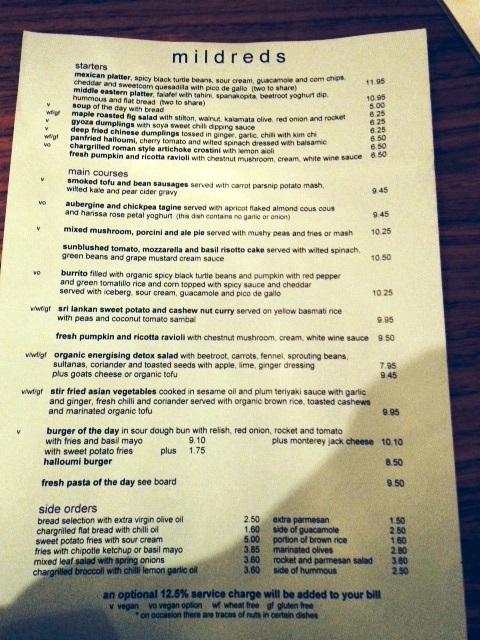 The vast majority of the menu is vegan and a lot of it raw. 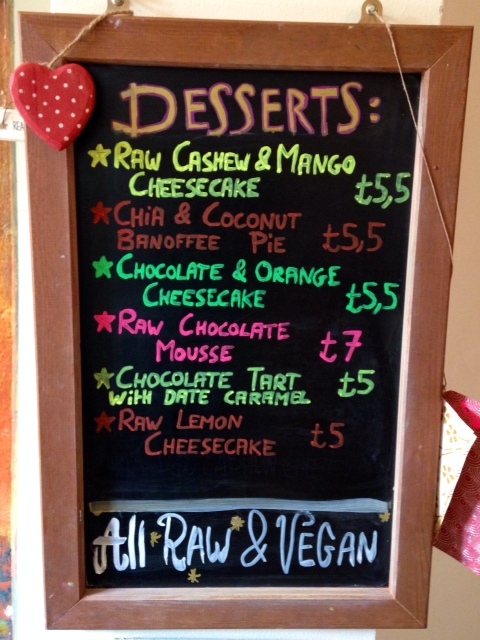 For anyone who is nervous of the phrase ‘raw vegan’ and presumes they will be faced with a plateful of rabbit food sprinkled with bird feed then fear not – it is astonishing what these guys create and you really don’t even notice that it’s raw. I started with their ‘Incredible Green’ super smoothie – apple, celery, lemon, banana, kale, fresh coconut, fresh aloe vera, fresh irish moss. It’s £6 which is pretty expensive but it’s almost a meal in itself. A hearty comforting glass of goodness. Then I ordered THE WILD BURGER – scrumtious shiitake, raw olive & dulse burger with in-house cultured Wild Sauce, tomatillo salsa verde, caramelised onions, baba ganoush & crispy gem lettuce in a wholemeal sprouted organic wheatbread(V)(N)(R) £12. Completely delicious and filling, although not the biggest plate of food for £12. Ed had the WILD PIZZA SPECIAL – raw, dairy-free young coconut cheeze, wild sea purslane & basil pesto, raw cultured tomato & goji berry marinara, Turkish olives, artichoke hearts, avocado(V)(N)(R) £12.5 This was the star of the show and honestly one of the most delicious meals I have ever had in my life. It made me want to rush out and buy a dehydrator immediately! 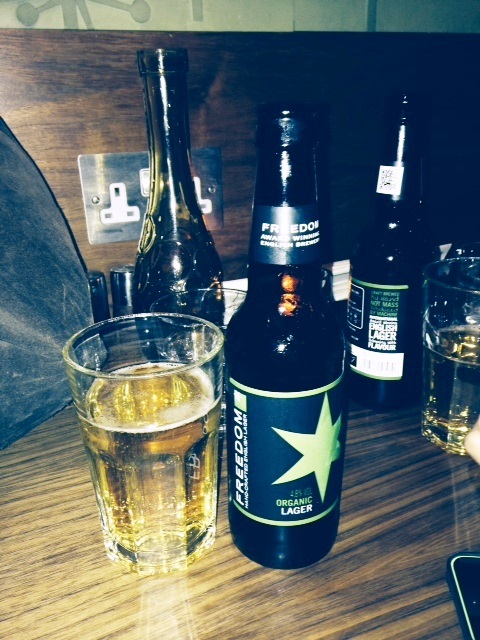 Oh and the waiting staff are really knowledgeable and helpful… and exceedingly attractive which is always always a bonus! 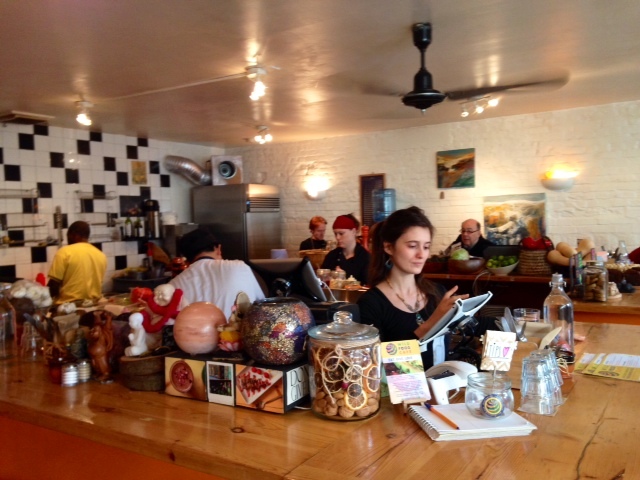 Wild Food Café has a real community feeling about it. They offer cooking courses, full moon feasts, meditation sessions, gourmet meals with guest chefs etc… Go check it out! Great documentary well worth half an hour of anyone’s time. It’s nice to come across a documentary about veganism which doesn’t include lots of graphic images of animals being abused which no one wants to see. This thoughtful documentary gives a snapshot of a dozen or so different people who have adopted a vegan lifestyle for various different reasons ranging from an elite marathon runner to a top London chef and from a stock free veganic Hampshire farmer to a breastfeeding mother. Really thought provoking and insightful. I was so excited about my first trip to NOPI and had heard such great things. I have all Ottolenghi’s cook books and they have been faithful friends over the past year, comprising of mostly vegetarian recipes which are easily reconfigured to vegan ones and many many vegan ones too! 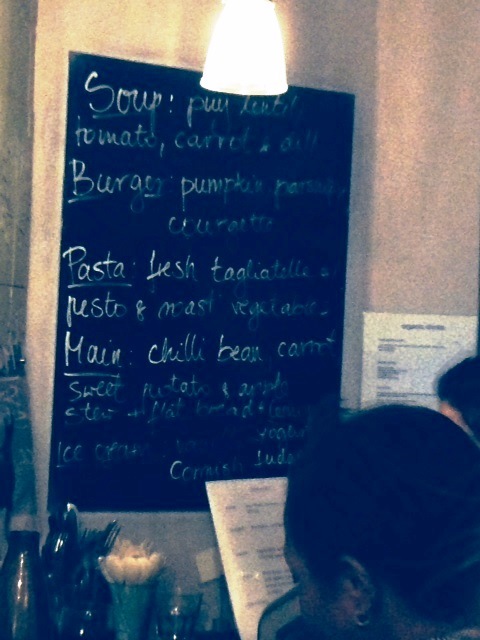 So for vegans – Ottolenghi is our friend! Or so I thought…. The whole evening was probably the most stressful restaurant experience I’ve had since going vegan (except possibly for the French chef who slowly garrotted and then quickly guillotined me with his eyes when I asked whether his chips had been cooked in animal fat….!). Being an Ottolenghi restaurant, I didn’t bother phoning ahead (which I usually do) to ask whether they would be able to cater for me. I just assumed it would be no trouble. 1st mistake. What I knew would happen was exactly what happened. The plates just came with the non-vegan bits removed. So dry roasted aubergine & pistachios and dry sweet potato with seeds – all horribly dry and turning my mouth into an endless cement mixer. This obviously really annoyed me as I had tried to be as cooperative and respectful as I could be by offering to forego my veganism for the evening in favour of sampling their amazing food. Having said that – the edamame bean dish was incredible so it was a complete disaster! I didn’t say anything of course and just put it down as a good lesson learned. Remember – always phone ahead and don’t let waiters and waitresses bully you into ordering something you know is not what it seems! So I sought solace in a delicious soya latte. But I should hasten to mention that everyone else’s meal looked absolutely delicious and every plate was licked (quite literally) squaky clean! 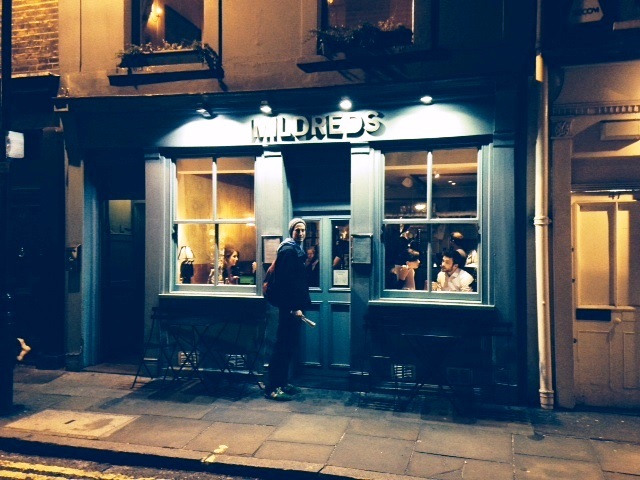 Had another great evening at Mildred’s last night. Got there at 7pm and it was absolutely rammed. Mildred’s has been going since 1988 and is probably the most famous vegetarian restaurant in London. It’s nestled in Soho and always has a great atmosphere. 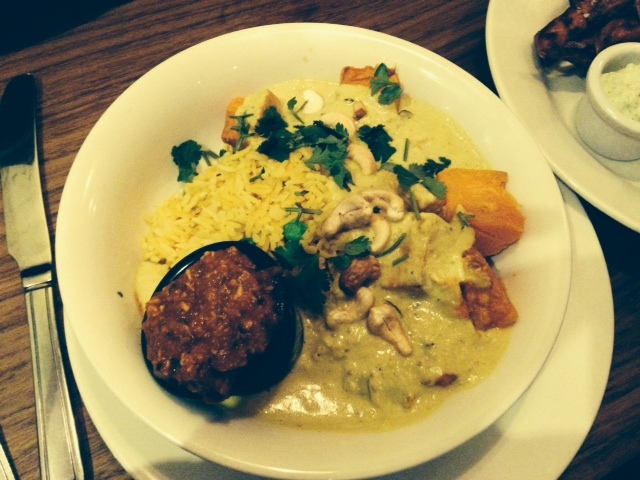 I had a delicious Sri Lankan sweet potato and cashew nut curry which was incredibly creamy and tasty and Ed had the Special burger which was Pumpkin, parsnip and courgette and delicious! 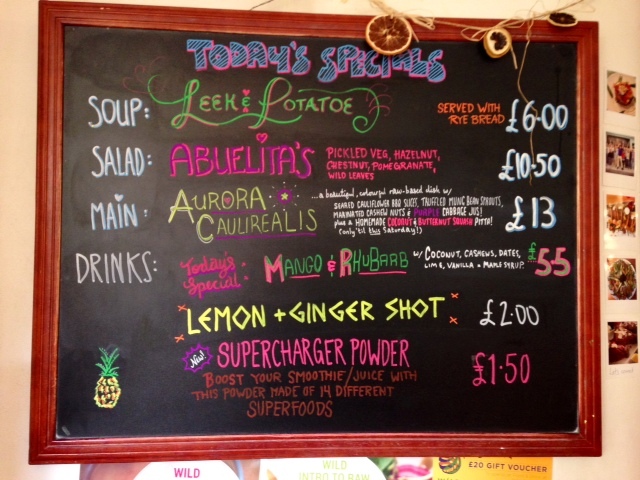 Here’s the menu and the Specials board – everything’s reasonably priced and they are huge portions. I was completely stuffed and we had only shared a starter and had a main each. Food comes really quickly as they don’t do reservations so it’s a quick turnaround. Perfect for grabbing a quick bite. The whole meal came to about £40 (2 beers, 2 mains and a starter). Great place, def recommend.